August 21, 2018. After seven years on the waiting list, I'd assumed it was never going to happen. Then, out of the blue, I got the news that my name had gradually worked its way to the top and that I was to be alloted a plot. Could I please arrange to visit and to pick up the keys (one for the padlock to the allotment itself, and another for the on-site toilet) as soon as possible? After the shock came apprehension. I've always loved gardening, but surely being a plotholder was going to change everything. Like owning a dog, this was going to thwart my cherished freedom. I'd no longer be able to head to the hills - or, indeed, work! - without worrying about weeds, or being reprimanded by the allotment committee for neglecting my growing space. Chef Andrew Fairlie's tweet in response to my online announcement of the news seemed ominous: "Say goodbye to your spare time," he'd said, half-jokingly. And he would know, being responsible as he is for his own professional kitchen garden. Then I saw it, and my heart flipped. It was much larger than expected, and it was covered in weeds. But fruit and veg were also growing, thanks to the efforts of the previous holder. There was a cute wee shed (though, being a Weegie, I’ve always called it a ‘hut’). I was immediately welcomed by neighbouring plotholders, who offered me potatoes, beans, courgettes and plums from their own harvests. I had apples from my own tree. The first taste of a raspberry freshly plucked from its cane was indescribably exquisite. I remembered why I'd hankered after an allotment for so many years. Three weeks on, I look forward to every visit. I'm glad to have got it in August because it gives me time to clear up and plan for next spring. And there are lots of issues I’d like to air here concerning, for example, the laws around allotments, more access to land for growing, and so on. But first things first. Weeding. Yesterday I filled six large bags - many the size of the uprooted dandelion in my photo above. And eradicating the stubborn invasives like Mare's Tail and Bindweed can eat up the day. 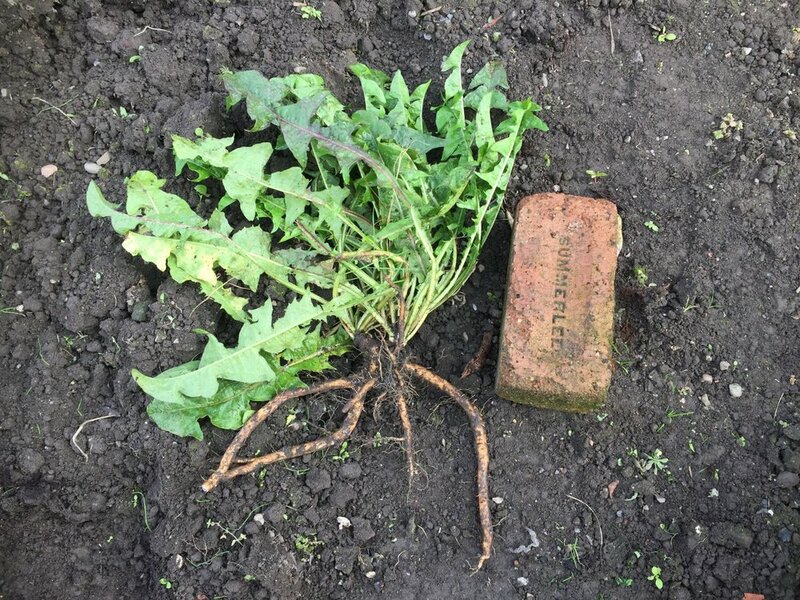 It took me a long time to chase the root of one particularly elusive bindweed root across and under one of my raised beds. It was over six feet long.